The Spiders trace their unique moniker to 1894, when a heckling fan yelled something about Richmond’s baseball players having arms like spiders. Reporters repeated the nickname, and it stuck. Richmond has the only Spider mascot in collegiate athletics. Spiders are even incorporated into the academic curriculum. Faculty, staff, and students in the biology department care for and study a number of tarantulas, including the official mascot of the men’s basketball team, Tarrant. 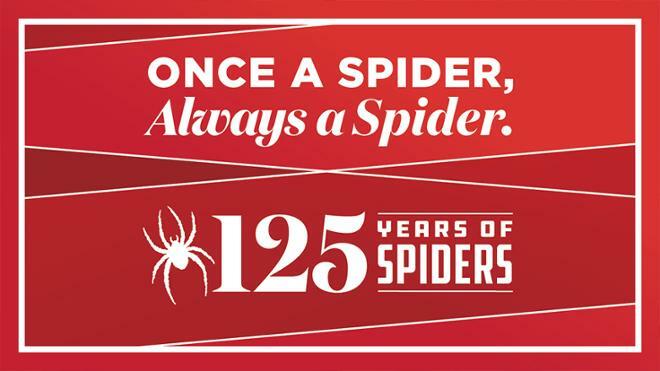 In the 125th year since the University embraced its Spider identity, Richmond is celebrating a thriving community of Spiders. Today there are more than 51,000 Spider alumni worldwide. Leland Melvin, UR board member, astronaut, and Spider, said, “My own Spider experience gave me the academic and athletic confidence to pursue ambitious dreams that eventually led me from the NFL gridiron to the tranquil beauty of seeing our planet from the International Space Station. My professors and coaches instilled in me a high level of curiosity and grit that helped this proud Spider to rise." Learn more about 125 Years of Spiders.